Is the Adventure Kings Portable Solar panel range the BEST VALUE panels on the market? We’re riding the end of the summer wave, so you might be asking ‘is solar power really for me? Will I really benefit through winter?’ the answer is yes, in some respects the temperatures of autumn, winter and spring, can actually improve solar panel efficiency, even with reduced hours in the day! So you’ve decided solar is for you, there are plenty of Solar panels flooding the campsites of Australian 4WD and caravanning communities, but what exactly makes a good solar panel? How do you know what you are looking for? The whole Adventure Kings range of 12 Volt solar panels boasts excellent performance for the money. Depending on your setup, the Adventure Kings solar range has a system that can suit. For the lighter duty setups, you can easily get by with one of the 10w USB portable solar panels this simple panel folds neatly and has plenty of charge to power your USB devices no matter where you are and can even be hooked onto the outside of a backpack to charge your cameras whilst you hike. If you were looking for a little more power for your 12v setup there is also an Adventure Kings 110W fixed panel, this panel outputs up to 22 volts and when coupled with a voltage regulator like the Adventure Kings PWM or the Adventure Kings MPPT solar regulator can be connected to your battery for absolute versatility at camp. The Adventure Kings 110W fixed panel is combined perfectly with a CTEK DC-DC charging system like the CTEK D250SA coupled with the Smartpass 120 you can connect your panel directly to the ctek system and it will automatically regulate voltage to be suitable for nearly any battery setup! The Adventure Kings 110W fixed panel is versatile and can add stacks of power to many different permanent 12volt setups. 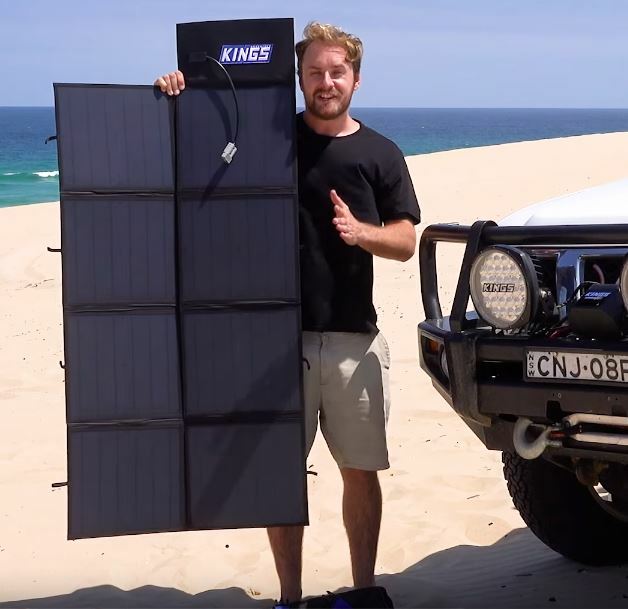 Adventure Kings are pioneers of affordable solar power for your 12v setup, their newest product in the solar range is the Adventure Kings 120W solar blanket. This system utilises 8 highly efficient monocrystalline cells. The Solar blanket folds into a tidy 400mm x 400mm package and slips neatly into its zip up storage bag. Using the integrated PWM regulator, you can monitor your batteries voltage, and make sure everything is charging smoothly. The Adventure Kings 120W solar blanket kit includes 4.4m of heavy duty cable with alligator connectors to easily charge your batteries. The portable solar blanket is 1420mm x 725mm and fits easily over most vehicles windshields and offers extra shade for your vehicle, keeping the interior cooler and making your 12 volt fridge run more efficiently. The Adventure Kings 120W solar blanket offers more versatility and compactness than many other panels on the market and is more competitive than many others on the market, which can reach around 4 times the price! A more powerful 12v charging setup can be had with the Adventure Kings 160w Solar it comes with fold out legs, and an integrated PWM controller. An Adventure Kings 160w Solar panel has enough power to keep all your standard 12v campsite accessories powered. The Adventure Kings 160W Solar Panel is an all included self-contained panel. Included with the Adventure Kings 160W solar panel includes a massive 5m cable fitted with an Anderson plug. The Adventure Kings 160W solar panel for ease of use and simple plug and play battery charging! There aren’t many campsites that cannot be powered by the powerful Adventure Kings 160W Solar Power, but for those who are chasing the most powerful bang for buck available the Adventure Kings 250W Solar Panel setup has enough juice for even the most power-hungry setups. The Adventure Kings 250W Solar Panel uses a clever MPPT solar regulator. Comparatively the MPPT Solar regulator will enhance the solar efficiency in even low light conditions up to 35%. Using the 2 panels together will give almost most double the output of the Adventure Kings 160W Solar Panel in low light conditions. It’s very hard to look past the power output and versatility of the Adventure Kings 250W Solar panel for outright grunt and given faster and lighter camping setups the MPPT controller will make the most of any sunshine and let your 12v appliances crank along nicely. No matter what camping power you need, there is an Adventure Kings solar panel that can help you get powered up!